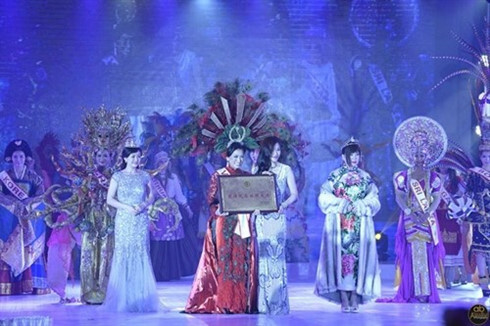 Vietnam’s Tran Thi Diem Trang (Kelly Trang Tran) won the Best Traditional Costume award at the Mrs. World Pageant, which was held in Dongguan, China. Trang won the award for a Vietnamese long dress (ao dai) she had designed herself. The costume, made by hand over five months, combined various traditional patterns such as the bronze drum on cloth and a hat modified from a design that was used during the Hung kings’ reign (2879-258 BC). Trang said the contest helped her to gain more confidence and she learned a lot from other contestants’ success with life, their careers and family. Trang, born in 1980 in Vietnam, has been living in the United States since 1993. She lives in Nevada and works at a bank and as a freelance model. She has won various titles such as Mrs. Alhambra International 2006-07; Mrs. Vietnam Los Angeles 2008-09; third runner-up at Mrs. Asia USA 2008-09; and first runner-up at Mrs. Vietnam Global 2012-13. Among the charity activities she does, she teaches Vietnamese free of charge to Vietnamese-origin youth in her town over the weekend.